The all-new Hyundai Genesis is only available in ‘restricted numbers’ but potential buyers will find car that is packed with a premium level offering along with innovative technology. Hyundai have built up a strong reputation in recent years for the excellent, well priced vehicles and the Genesis is in the same mould as its able siblings. However, the Hyundai Genesis is up against some very stiff competition but it’s well priced for the level of luxury that’s on board. Hyundai says the new model underlines its promise to provide the car-buying public with ‘value beyond expectations’. 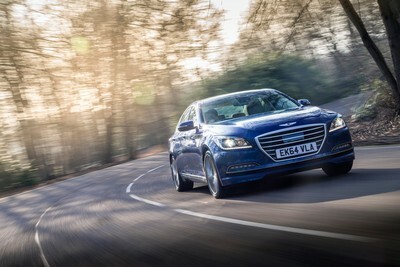 Available from April, the Genesis is available from a select number of Hyundai dealerships (indeed, there will only be seven around the UK) and from car leasing firms like First Vehicle Leasing. Underneath the bonnet is a powerful V6 GDI 3.8 litre engine delivering power to the rear wheels and which is coupled to an eight speed automatic transmission. The result is a smooth and responsive drive. There’s plenty of space on board, the seats are finished in fine grain leather, and there’s a range of new technologies including an impressive infotainment system which utilises an 8 inch touchscreen. There’s also a slew of impressive safety features including the world’s first cabin sensor for C02 which will detect drowsiness in the driver and sound an alarm accordingly. Four cameras help provide an all-round view for safety, there’s also smart cruise control and a traffic system which detects potential problems and obstacles in the road. The Genesis also uses a head-up display which sees the car’s vital information being projected onto the windscreen. It certainly has an eye-catching design and for anyone wanting luxury and innovation, the Hyundai Genesis makes for an ideal choice particularly if the buyer wants to stand out from the crowd of mainly German-built competitors. As the flagship of the Hyundai fleet, the Genesis offers a lot in a great package and it features the firm’s latest technology and impressive refinement. The Hyundai Genesis is the firm’s flagship and is priced from £47,995 OTR. This entry was posted in Car Leasing, Car Updates & Releases, Cars, Executive Cars, Luxury Cars, Manufacturer News and tagged hyundai, hyundai genesis by Steve Lumley. Bookmark the permalink.